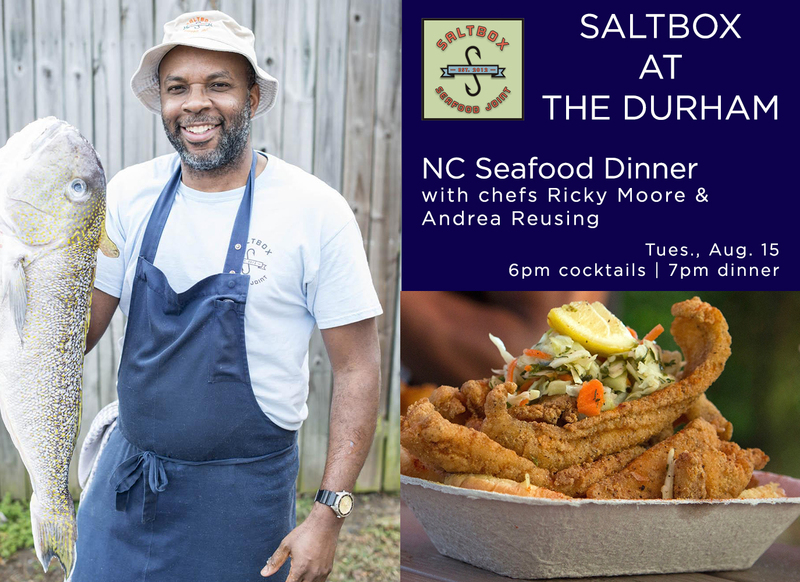 Celebrate the upcoming opening of Saltbox Seafood Joint’s new location with a family-style summer seafood dinner with chefs Ricky Moore and Andrea Reusing. Join us early for a cocktail hour on the roof with snacks from Saltbox and The Durham, or meet us in the restaurant for the main event where Andrea and Ricky will be cooking an al fresco feast of NC seafood family-style dinner including wild head-on shrimp, Hatteras oysters and fisherman’s favorites that don’t often make it in from the coast like porgy, spade fish and live crawfish. Peach leaf sangria and cold cans of NC beer will be flowing as we toast the new Saltbox. 6pm – Roof: cocktail hour with snacks from Saltbox & The Durham – $15, includes a drink, tax, and gratuity. 7pm – Restaurant: 3-course dinner seated & served family-style with communal tables – $35, not including beverage, tax, and gratuity. Reservations required and can be made at 919-768-8831.